This week Mum decided to use FotoSketcher again because she loves the realistic effects that can be achieved with this free photo editor. 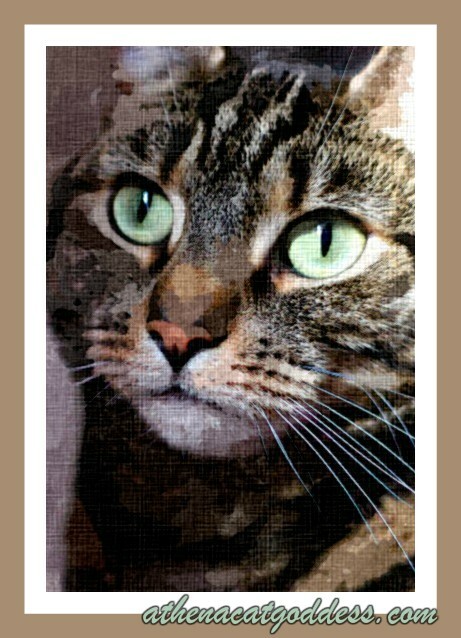 For this Caturday Art photo she used the watercolour 5 effect and it looks almost as if she painted it herself! We've never tried that one....it sure made a nice effect on your photo! That was a beautiful effect! How pretty! I've always loved the effect of watercolor, and you sure look especially lovely this way, Athena. Purrs! Lovely result! Our mom played around this week with the Waterlogue app! Pawsome effect! Is FotoSketcher something that has to be downloaded or is it a mobile app? Athena you are a work of art yourself! That's a beautiful picture, Athena. To me, it looks a little more "canvas" than "watercolor" but the important part is that you're so pretty! Very pretty, but then, you would be darling girl, no matter what!